First found in 1967 in the north-east Mountains of Tasmania, this stone is said to protect and preserve health and honour. Tsavorite is a variety of the garnet group, trace amounts of vanadium or chromium provide the green colour. In 1967, a British gem prospector and geologist discovered a deposit of Tsavorite Garnet in the mountains of north-east Tanzania in a place called Lemshuko. The specimens he found were of very intense colour and of high transparency. 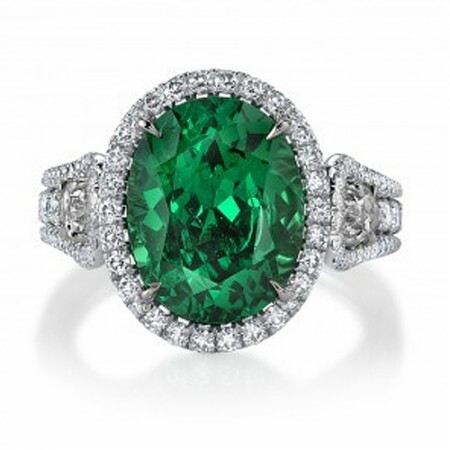 Rare in gem-quality over several carats in weight, tsavorite has occasionally been found in larger sizes. In late 2006 a 925-carat (185 g) crystal was discovered. It yielded an oval cut 325 carat (65 g) stone, the largest faceted tsavorites in the world. Garnet was supposed to have strong curing powers. In powder, it was used as poultice to relieve fever. As an amulet, it was favored by travellers, for it was said to protect and preserve both health and honour, cure the wearer of all diseases and guard from all perils during the course of a journey.